We are on board a probe that has gone down in the pages of history because it is the second-most remote manmade object from the Earth. We have been travelling for forty years, and in about 2 million years we will draw close to star Aldebaran of the constellation Taurus. At a distance of 65 light years (1 light year = the distance light travels in a year = 9, 5 1012 km) from the Earth perhaps we will find other planets, which might be inhabited by evolved civilizations. With us we are carrying a metal plate, a sort of identity card that describes the Earth and its inhabitants. We are on the Pioneer 10 space probe. We have represented the first attempt to make contact with alien forms of life. It is more of a hope than a real aim. Yes, because we would be really lucky to find another planetary system with a planet similar to the Earth on which forms of life have evolved and have reached the level of technology that is necessary to interpret our “visiting card”. The probabilities are rather remote, and however we will not be able to know this before 2 million years. Really too long for curious space explorers! The story, like in a book, tells of the adventure of the mission of the Pioneer 10, which began in 1972, when also the first missions of the Mariner had just taken off, to explore Mars, Venus and Mercury. Few years after the Pioneer was launched, in 1975 also the Viking missions took off, and these were the first to send a lander on the soil of Mars and were able to show us high resolution images of the Martian panorama. The first delusion was immediate, on the Red planet there were no signs of any Martians. Our need to get into contact with some “alien listener” materialized in the SETI (Search for Extra-Terrestrial Intelligence) project, a programme dedicated to the search of intelligent extraterrestrial life forms that are sufficiently evolved to be able to send radio signals into space. The SETI project was born in 1974, since its inauguration a symbolic attempt to contact other forms of life was made. 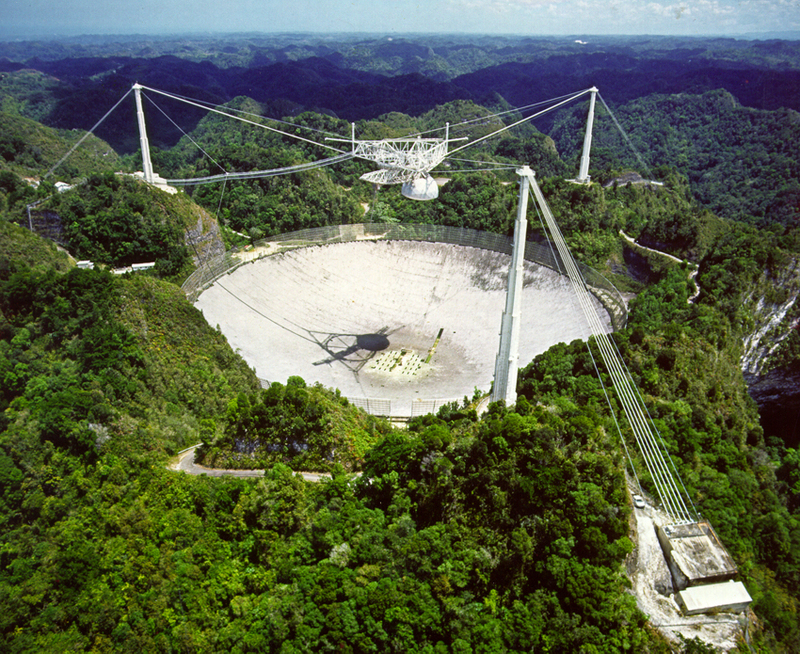 A radio signal was sent with the powerful 305 metre Arecibo radio telescope. 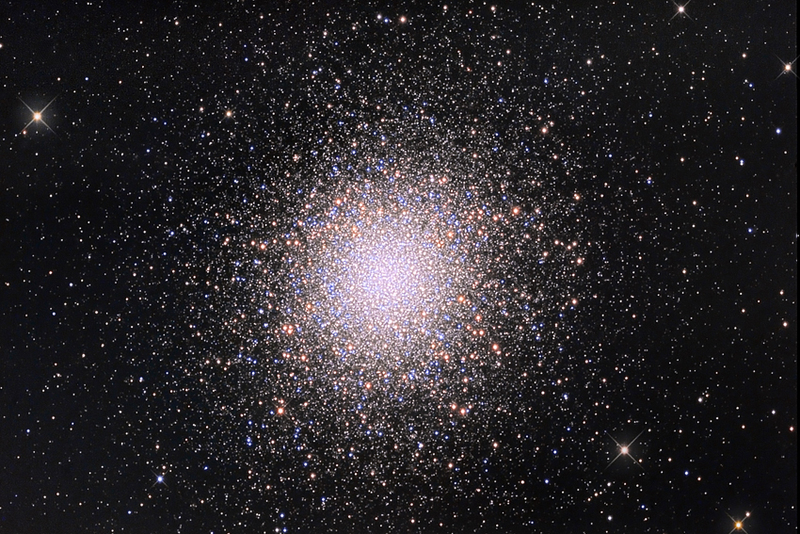 The message was sent to the globular star cluster M13, in the constellation Hercules which is 25,000 light years from us. It is the most luminous globular cluster in the northern hemisphere and is visible even with the naked eye. The substantial difference from the Pioneer mission is that the radio message travels at the speed of light. The target was chosen on purpose because a cluster can contain hundreds of thousands of stars, and there is a greater probability that one of them might have a planetary system with a planet on which a society has evolved that is able to receive the message and interpret it. 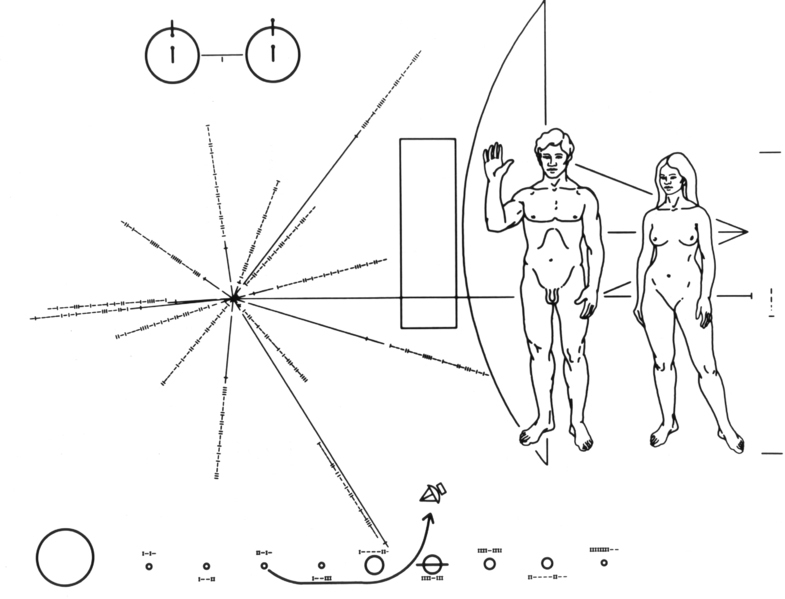 The message contained elements that were similar to those illustrated in the plaque of the Pioneer 10: some data on the position of the Earth in the Solar System , the representation of a human being, some chemical formulas and a drawing of the Arecibo radio telescope. Travelling at the speed of light, a possible response will only reach us after 50,000 years; for this reason the entire experiment has never had a great success. Today, exobiology (the science which looks for the presence of extraterrestrial life in the universe) is oriented more towards a search of traces that reveal the presence of forms of elementary life that can also exist in environmental conditions that differ from those on the Earth. Some of these are extremophile bacteria that are also present on the Earth near the mouths of volcanoes or beneath thick layers of ice in the Antarctic. They are called extremophiles because they live in extreme conditions. For them the lack of light and oxygen is not necessarily a problem. And within our own Solar System, there are many areas that are different from the Earth where it is probable to find the extremophile bacteria present. At a distance of about five astronomical units (1 a.u.= distance of the Earth-Sun = 150,000,000 km) from the Sun, near Jupiter’s orbit, is one of its largest moons, Europa. It was discovered in 1610 by Galileo Galilei with the help of his telescope and in 1995 Europa once again returned to the limelight because of the astonishing images from the Galileo orbiter which flew over the satellite several times in its eight years of activity (1995-2003). Exploration of Jupiter’s moon is considered of primary importance because it is considered a habitat that is suited to support life. It has been discovered that under the surface, Europa has an entire ocean of water in the liquid state. The forces of the tides caused by Jupiter’s gravitational interaction provoke continuous movements of the satellite (stretching and contraction), which could maintain the water in the liquid state, and also warm enough to favour the beginning of simple forms of life. The Sun, in fact, with its heat is unable create and maintain an ecosystem, because Europa is about 5 times more distant than the Earth, and as a consequence receives 1/25th of the heat that reaches the Earth. 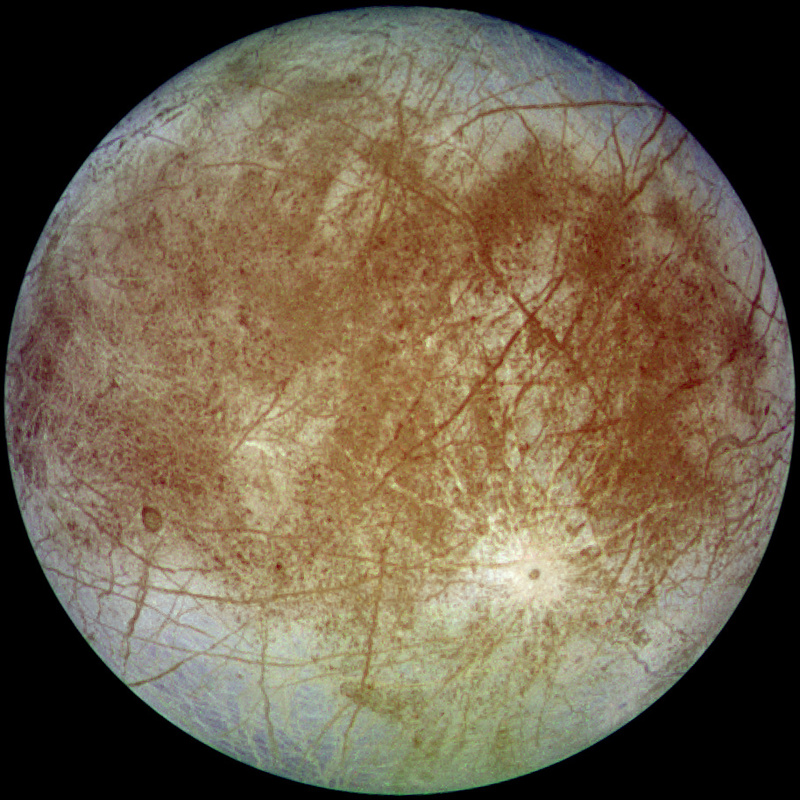 The “inhabitants” of Europa could be similar to some living organisms which lived on the Earth, such as the Archaea or Archaebacteria, which consist of single cells without a nucleus or Endoliths, micro-organisms that live on Earth in cracks between rocks, that could be found in Europa in the thick layer of ice on its surface. 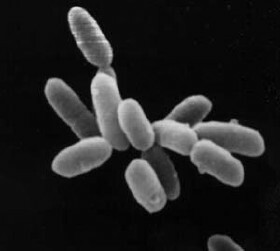 Image of a Halobacterium, one of the possible forms of life present on Europa. On the Earth it can be found in places with a very high concentration of salt, such as the Dead Sea or the Great Salt Lake in Utah. Therefore, remaining in the Solar System, we have found at least one other world in which it is possible to trace life. The same may occur in other planets and other planetary systems. Obviously we cannot send probes to study these planets because a journey, with the present technologies, would require too much time. We can however analyze the chemical composition of the atmosphere at a distance. In fact living organisms, even though they are small, modify the environment and what is being searched for, are distinctive signs that can easily be traced at a distance. First of all we try to discover if there are other planetary systems and if in any one of these there are planets that are similar to the Earth. An extrasolar planet is a planet that does not belong to the Solar System, in other words its orbit is around a star that is not the Sun. Since 1995, the year in which the first extrasolar planet, 51 Pegasi b, was discovered in the constellation Pegasus, over 830 extrasolar planets have been identified. This is an enormous number that will grow exponentially also thanks to the improvements in scientific instrumentation. How are they discovered? And how many of these can support life? The discovery of an extrasolar planet occurs principally as a result of indirect observation methods. Some indirect effects that reveal the presence of the planet are traced. It is like finding oneself on the site of a homicide, we do not see the assassin, but by collecting different clues, we discover who committed the crime. The direct method, i.e. observation through telescopes, is used increasingly rarely because it only enables the discovery of planets that are similar to Jupiter, gaseous giants that are very different from the Earth. Let us analyze the two principal indirect observation methods more in detail. 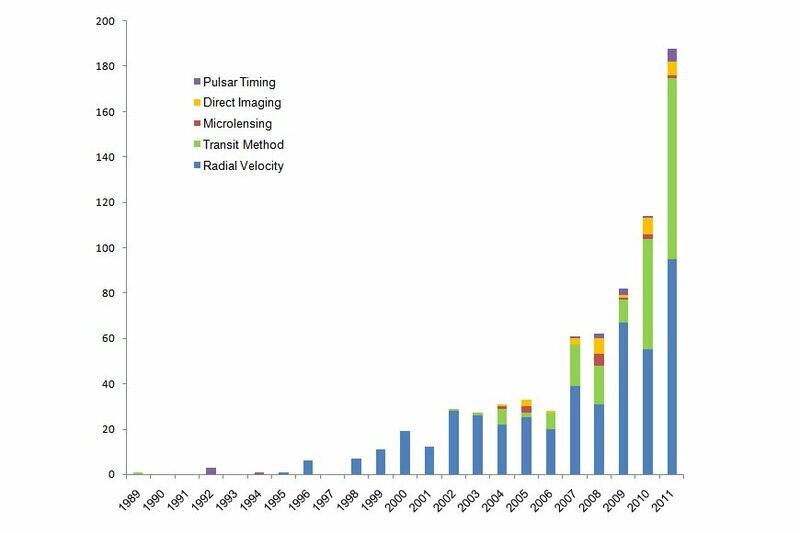 To date, the most effective research method is the radial velocity method. In a system consisting of a star and a planet (binary system), both bodies rotate around a common centre of mass. If we analyze the spectrum (intensity of the radiation emitted by a source, depending on the wavelength) emitted by the star, we discover that the emission or absorption lines shift to blue or red, depending if the star is drawing close or moving away from us. 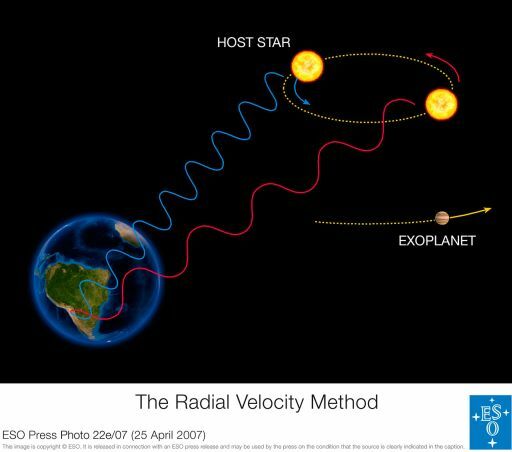 By analyzing how the spectrums vary in time, the radial velocities of the star and the planet are obtained. Use of this method is limited to stars brighter than 15th magnitude because otherwise it would be impossible to obtain good quality spectrums that can measure small variations in speed. This is the second most utilized method and it is becoming popular again because of the recent discoveries of planets similar to the Earth carried out by the American satellite Kepler. When a planet, rotating around a star, transits in front of its disc, the brightness of the star decreases slightly. When an extrasolar planet transits in front of a star, there is a small decrease in the total brightness of the star. Greater is the variation in the brightness, greater is the size of the planet. With this method it is possible to obtain the radius of the planet. Credits: INAF. Attenuation depends on the size of the star and of the planet. 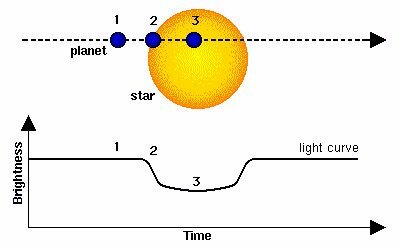 Once the light curve of the star has been measured (graph of the brightness depending on the amount of time) indirect measurements on the period of rotation of the planet and its size are obtained. In some cases, with the help of spectroscopic measurements, it is also possible to obtain indications of the chemical composition of the planet’s atmosphere. How many of these extrasolar planets could support elementary forms of life? The search for extrasolar planets concentrates substantially on the search of planets that are similar to the Earth, in size and also chemical and physical conditions. More specifically in order to support life, the candidate extrasolar planet should be positioned within the habitable zone, i.e. an area around a star in which the planet may present conditions of temperature that allow the existence of water in the liquid state, a factor that is necessary for life to develop. If we analyze the habitable zone of the Solar System, we discover that the Earth is almost in the middle of this zone. Unfortunately the present surveying methods enable us to discover mainly extremely hot planets that are near to our star. To date, the satellite Kepler has discovered only one planet, called Kepler-22b, which is positioned within the habitable zone. 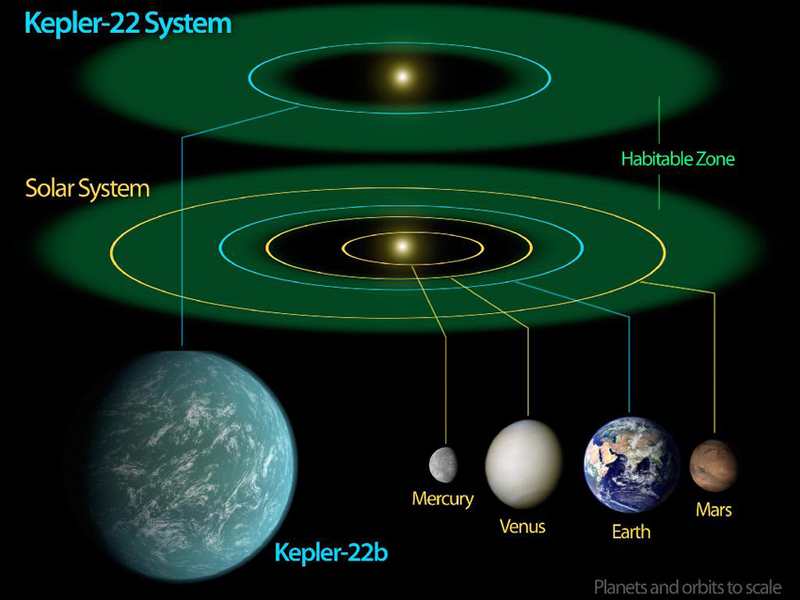 Kepler-22b is an Earth-like planet with a mass that ranges from a rocky planet to a gaseous one (a Super Earth) at a distance of 600 light years. It rotates around the star Kepler -22, a yellow dwarf star, in the habitable area; the mean temperature on the surface appears to be approximately 22°C, an optimum condition for the presence of life. From 2009, the year in which it was launched, the satellite Kepler has identified over 1200 candidate planets, some of which could be very similar to the Earth. Therefore it will not be long before we will be able to communicate that we have discovered a planet where there is life. Starting from long ago, in the year 1995, when it seemed that the Solar System was bound to be the only planetary system of our universe, over 800 planets have been discovered and some of them may even be very similar to the Earth. The number is very big, but this is only the beginning and we actually have not gone very far. Considering that the Earth coincides with our Universe, up to now we have explored a part of the universe that is the size of a football field. The distances we have covered in search of an extrasolar planet are extremely small, if we note that our Solar System is about 30,000 light-years from the galactic centre, and the entire galaxy has a diameter of 100,000 light-years. This is just like an appetizer. Astrophysicist and scientific divulger, for the Planetarium in Turin she is in charge of training and development and displays and settings in the museum.